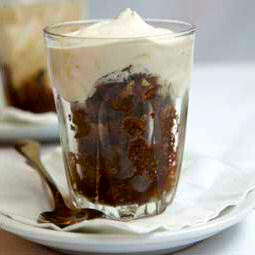 Godiva Coffee Granita - Icy Pick-Me-Up | We Like to Cook! During these dog days of Summer, nothing is more welcome than an icy refreshment; something frozen with caffeine to ward off the lethargy that accompanies hot, muggy afternoons. 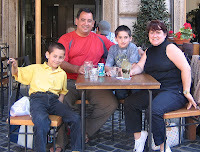 On our family trips to Rome, we became quite enamored of the Tazza d'Oro Café in the Piazza della Rotonda adjacent to the Pantheon. Tazza d’Oro, founded by the Fiocchetto family in 1946, is world famous for its granita di caffe: sugary espresso (strong and undiluted) frozen into a crystalline slush and served with a generous dollop of unsweetened whipped cream so cold it freezes where it touches the coffee, turning into little bits of solid cream. Tazza d'Oro imports and roasts its own coffee beans to create its secret house blend of top Arabicas called "La Regina dei Caffe." 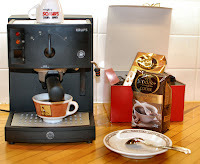 Since their proprietary blend is not readily available in the U.S., we decided to try Godiva Coffee which we received as members of the Foodbuzz Tastemaker Program. Godiva Coffees contains 100% Arabica coffee and in its natural and unadulterated state has no measurable sugar. 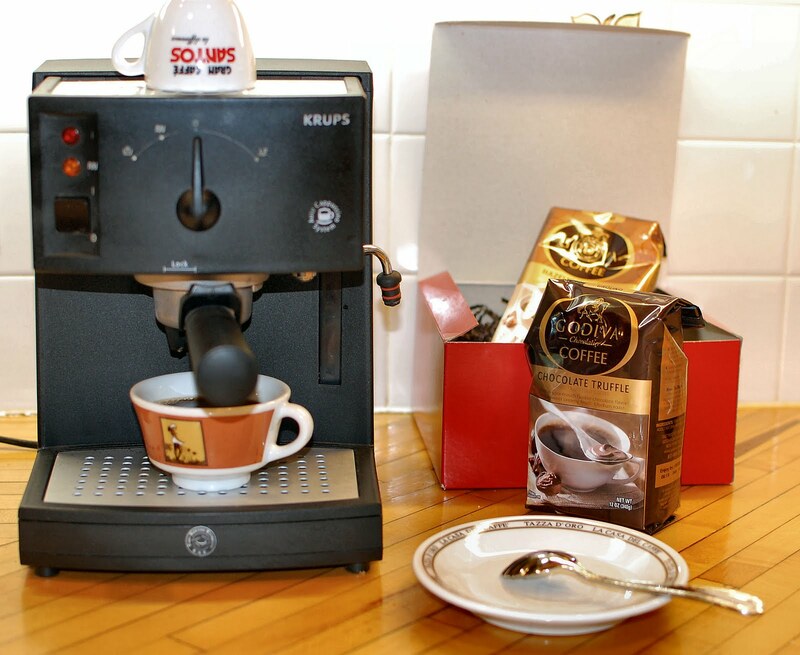 For an even more delectable treat we selected Godiva’s Chocolate Truffle coffee. Godiva’s Chocolate Truffle coffee is rich and decadent with deep chocolately undertones. Just opening the bag filled the entire kitchen with its scrumptious aroma. We made our granita using an espresso machine with the Godiva ground coffee, and it worked perfectly. Remember, just don't stint on the quantity you use. Stir sugar into the hot coffee and stir well to dissolve. Then pour the coffee into a freezer-proof container or dish and freeze for 30 to 40 minutes, until the coffee starts to form crystals. 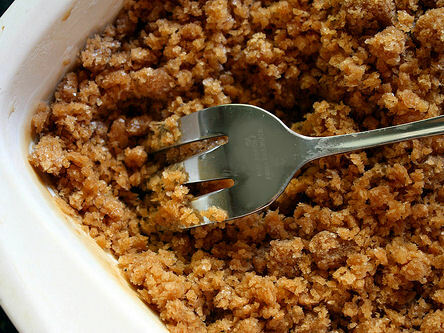 Remove the dish from the freezer and scrape with a fork to break apart the crystals. Return the coffee to the freezer, removing and stirring it vigorously every 15 minutes or so, until the coffee is thoroughly frozen and splintery like sorbet. This should take about I hour in total. If made well in advance just keep scraping periodically to keep crystals separated otherwise they will solidify into a block of coffee ice. Using an electric hand mixer or a standing mixer fitted with a whisk attachment (you can use a hand whisk, but it will take a good bit longer) beat whipping cream. Start slowly, gently increasing the speed as you go. If you set the mixer on high at first, you'll have cream all over the place. Set the mixer so it goes as fast as possible without splashing. Whip the cream until soft peaks form making sure not to over-beat else the cream will then become lumpy and butter-like. Spoon the granite into the bottom of each serving glass and finish off each glass with 1 heaping tablespoon of whipped cream. Serve immediately garnished with cinnamon or shaved chocolate, if desired. Trifecta! Love coffee. Love Godiva. Love Rome. I can't wait to make the Godiva Coffee Granita! So perfect for the summer heat. Please tell me how to be part of the Foodbuzz Tastemaker Program.